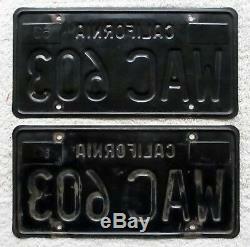 Here is a pair of 1963 through 1969 California License Plates. This pair is Guaranteed DMV Clear. In California, if you have a vintage vehicle that was manufactured in the years from 1963 through 1969, you can register these plates to that vehicle. For all years other than 1963, you will ALSO need to have the appropriate year sticker. This pair can be used for any of those years, but would be very appropriate for a 1968 or 1969 due to the plate number. Also, this pair can very easily be restored. 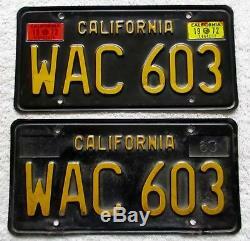 The item "1963 1969 California License Plate Pair DMV Clear # WAC 603, Muscle Car Plates" is in sale since Friday, January 25, 2019. This item is in the category "Collectibles\Transportation\Automobilia\License Plates\US\ California". The seller is "1381bruce" and is located in Santa Rosa, California. This item can be shipped to United States.